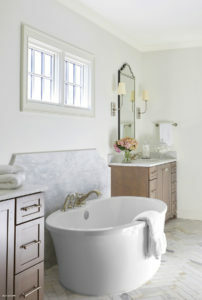 Under the design direction of Twin Construction, this new bath offers high style perfectly tailored to its owners. When Lynn and David Clanton decided to downsize, the one thing they didn’t want to give up was a spacious, luxurious bath. “I still wanted each of us to have our own, separate areas for getting ready in the mornings and for storing things,” says Lynn. With that request in mind, Twin Construction designed a symmetrical plan with his-and-her vanities flanking the freestanding, soaking tub. “The space used to be a bedroom, so we had plenty of room to create this custom layout,” says designer Danielle Robin. Nothing ups the luxe quotient like marble, and this bath offers plenty of it. To add some visual interest, Danielle used the material in unique ways, starting with the herringbone pattern of the floor. 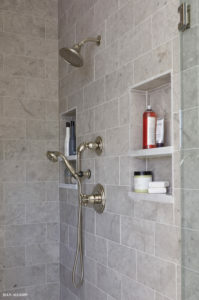 A marble backsplash behind the tub takes the place of adds a feminine touch with its sculptural curves.